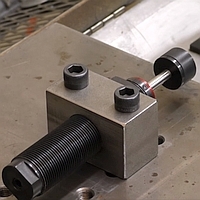 Demonstrating Impacta Industrial Shock Absorber Application Video Tutorial by Deschner, published on April 11, 2016. Impacta 7000 Series industrial shock absorbers are the value choice to decelerate fast moving equipment without bang or bounce. They deliver millions of maintenance free cycles and are leak resistant. The Impacta series is the next step in shock absorber technology, built to the same high quality standards as the Adjustable Cushioneer that set the bar for industrial shock absorbers over 60 years ago. Currently available in the popular "M25" size.